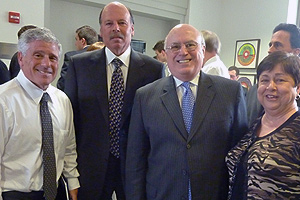 From left: Alan Meltzer, Richard Birnbaum, Chair of the Kogod Advisory Council, and Richard and Angie Clark at the March 23 Speaker Series event. Merck Chairman and former CEO and President Richard T. Clark, MBA '70, recently spoke to the Kogod community as the latest C-level executive to take part in the school's Alan Meltzer CEO Leadership Speaker Series. Clark, who has devoted almost four decades of his career to the company, a global health care leader, spoke about Merck's commitment to scientific innovation and corporate social responsibility. "What you hear in health care is cost – how are we going to drive the cost down?" Clark said. "The more interesting question is how to do so responsibly." According to Clark, company culture makes Merck appealing to potential employees. “We are an intellectual capital business,” Clark said. Merck employees are devoted to innovation in their field, but also to aiding communities; Merck allows employees to spend up to 20 company hours volunteering with a charitable organization of their choice. Merck has implemented a unique strategy that involves starting a dialogue with health care "payers" - typically insurers - before scientists begin working on a new medical innovation. "It was important because if you're going to get your product approved in the future...you've got to understand what innovations are meaningful to your customer base, which includes payers," Clark said. With an eye on patient care, Merck also employs a Chief Medical Officer, whose role is to "be the voice of the patient" - an advocate for patients. To help ensure that medical advances reach those who can benefit most from them, Merck often engages in partnerships. One is a joint venture with the Wellcome Trust, which has a not-for-profit mission to develop innovative, affordable vaccines for people in developing countries. The first project of the joint venture - known as Hilleman Laboratories - is to develop a heat-stable vaccine for rotavirus diarrhea, a disease that kills millions of babies each year. One of Merck's focuses, Clark said, is to make its medicines and vaccines sustainable and accessible to patients on a global scale – it's central to Merck's mission. "Until you can get a product to patients and sustain their ability to get that product," he said, "you haven't done your job." There are some roadblocks to that goal, however, since many people in developing nations can't afford medications, and their local countries do not have well established health care systems in place. In cases such as Botswana, where about one in six people are infected with the HIV virus, Merck has partnered with that country's government, the Gates Foundation and other not-for-profit organizations to provide a comprehensive approach to address HIV/AIDS - one that includes education, support, prevention, and clinical care, including free treatment. Clark said the key to success in Botswana is commitment – it took over six years to set up the kind of health care system that's needed to help patients as well as people at risk for HIV/AIDS, Clark said. "[Corporate social responsibility] is not something for people who just want a quick hit," Clark said, advocating that companies need to stick with programs for the long term if they want to truly make a difference. Merck has shown a sustained commitment, and today at least 80 percent of those in Botswana in need of HIV/AIDS treatment are receiving it, according to the World Health Organization. "If you are proactive and you address social issues," Clark said, "you can develop standards, you can address social and environmental issues, become partners with governments and NGOs, and improve the economy." In the Alan Meltzer series, Clark joins such CEOs as Paul Diaz of Kindred Healthcare, Michael Rosenberg of Promotion in Motion Companies, Eli Futerman of Hahn Automotive, and Mark Murphy of the Green Bay Packers.